Since the first edition was published in 1951, The Stevens′ Handbook of Experimental Psychology has been recognized as the standard reference in the field. The most recent (3rd) edition of the handbook was published in 2004, and it was a success by any measure. But the field of experimental psychology has changed in dramatic ways since then. Throughout the first 3 editions of the handbook, the changes in the field were mainly quantitative in nature. That is, the size and scope of the field grew steadily from 1951 to 2004, a trend that was reflected in the growing size of the handbook itself: the 1–volume first edition (1951) was succeeded by a 2–volume second edition (1988) and then by a 4–volume third edition (2004). Since 2004, however, this still–growing field has also changed qualitatively in the sense that, in virtually every subdomain of experimental psychology, theories of the mind have evolved into theories of the brain. Research methods in experimental psychology have changed accordingly and now include not only venerable EEG recordings (long a staple of research in psycholinguistics) but also MEG, fMRI, TMS, and single–unit recording. The trend towards neuroscience is an absolutely dramatic, worldwide phenomenon that is unlikely to ever be reversed. Thus, the era of purely behavioral experimental psychology is already long gone, even though not everyone has noticed. Experimental psychology and "cognitive neuroscience" (an umbrella term that includes behavioral neuroscience, social neuroscience and developmental neuroscience) are now inextricably intertwined. Nearly every major psychology department in the country has added cognitive neuroscientists to its ranks in recent years, and that trend is still growing. A viable handbook of experimental psychology should reflect the new reality on the ground. There is no handbook in existence today that combines basic experimental psychology and cognitive neuroscience, this despite the fact that the two fields are interrelated and even interdependent because they are concerned with the same issues (e.g., memory, perception, language, development, etc.). Almost all neuroscience–oriented research takes as its starting point what has been learned using behavioral methods in experimental psychology. In addition, nowadays, psychological theories increasingly take into account what has been learned about the brain (e.g., psychological models increasingly need to be neurologically plausible). 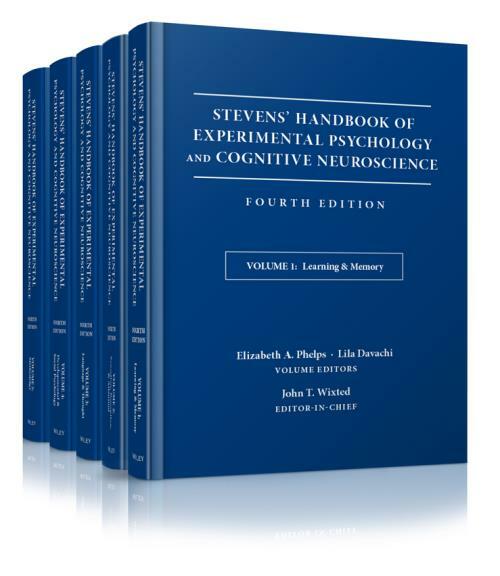 These considerations explain why this edition of: The Stevens′ Handbook of Experimental Psychology is now called The Stevens′ Handbook of Experimental Psychology and Cognitive Neuroscience. The title serves as a reminder that the two fields go together and as an announcement that the Stevens′ Handbook covers it all. Topics include fear learning; time perception; working memory; visual object recognition; memory and future imagining; sleep and memory; emotion and memory; attention and memory; motivation and memory; inhibition in memory; education and memory; aging and memory; autobiographical memory; eyewitness memory; and category learning. Topics include attention; vision; color vision; visual search; depth perception; taste; touch; olfaction; motor control; perceptual learning; audition; music perception; multisensory integration; vestibular, proprioceptive, and haptic contributions to spatial orientation; motion perception; perceptual rhythms; the interface theory of perception; perceptual organization; perception and interactive technology; perception for action. Topics include reading; discourse and dialogue; speech production; sentence processing; bilingualism; concepts and categorization; culture and cognition; embodied cognition; creativity; reasoning; speech perception; spatial cognition; word processing; semantic memory; moral reasoning. group processes; development of scientific thinking; language acquisition; category and conceptual development; development of mathematical reasoning; emotion regulation; emotional development; development of theory of mind; attitudes; executive function. Topics include hypothesis testing and statistical inference; model comparison in psychology; mathematical modeling in cognition and cognitive neuroscience; methods and models in categorization; serial versus parallel processing; theories for discriminating signal from noise; Bayesian cognitive modeling; response time modeling; neural networks and neurocomputational modeling; methods in psychophysics analyzing neural time series data; convergent methods of memory research; models and methods for reinforcement learning; cultural consensus theory; network models for clinical psychology; the stop–signal paradigm; fmri; neural recordings; open science.